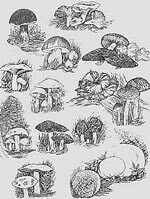 Yes, it seems as if we are always learning something new about mushrooms. For example, today we stumbled across the fact that the Fly Amanita (Amanita muscaria) is a good luck symbol associated with Christmas and New Year’s in many parts of Europe. Our first acquaintance with Amanita muscaria as a holiday ornament was last Christmas when we purchased a crocheted ornament at the Trondenes Historical Center in Harstad, Norway, where the gift shop was proudly displaying a basket of them. Stuffed with a light fiber filling, our specimen measures about 4 inches in height and about 3 ½ inches at the widest part of the cap. The stem and underside of the mushroom are snowy white while the cap is a brilliant red and dotted with white pearls which have been sewn onto the crocheted top. As you can see from the photograph, there is a 4 inch, black and white braided loop anchored in the center of the red cap so that it can easily be displayed during this festive time of year. Who knows what enticed me outside today, seeking the last of the winter mushrooms. Maybe it was the opportunity to wander aimlessly amongst the oaks and evergreens, to push aside the blueberry bushes and rhodies, to step lightly over downed limbs and bushels of fallen leaves. Or, maybe it was that at last we were experiencing a break in this season’s dreadful weather, and there was now a welcome sighting of blue skies and of a turkey vulture circling above the house. Actually it doesn’t matter what the motivation was for my foray this 1st day of March, because the end result was almost miraculous: 2 pounds of near picture-perfect hedgehog mushrooms (Hydnum repandum) and yellowfoot mushrooms (Cantharellus tubaeformis) gathered in less than an hour! appetizer. The recipe can be viewed at the bottom of this post. Our 2017 winner, Shauna Havey, created a scrumptious dish that quickly brought cries of "winner, winner" from our judges. No one could resist the appealing flaky crust that greeted them. Nor could they resist the fragrant mushroom filling that was enhanced by the incorporation of cremini and shiitake mushrooms. 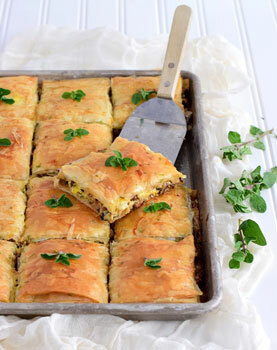 Shawna wrote that her submission was "an enticing blend of Shiitake and Cremini mushrooms sautéed in butter, aromatics, and Marsala wine...sandwiched between delicate layers of phyllo dough and baked until crisp and golden. This irresistible appetizer is as pretty as it is flavorful and will be a crowd pleaser anytime you serve it." We couldn't agree more. In fact, our judges not only commented on how lovely the squares are to look at with their golden multi-layer crust, but these judges are also believed that the squares would be an amazing addition to the dining table, suggesting that a mixed greens salad and fresh fruit might be the perfect compliments to make the squares a luxurious lunchtime choice. 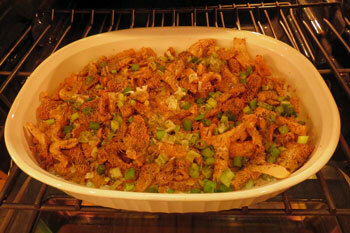 One last thought: the recipe makes 12 rather large appetizer servings. Seems like a lot to consume at one time ... or, maybe we just don't have enough friends! Anyway, we were quite pleased with the result when we enclosed the leftover pieces in plastic wrap and refrigerated them. Later in the week, as an experiment, we removed the plastic wrap and reheated the leftovers for about 5 minutes in a 350 degree oven - the squares were very well preserved, retaining all the things that made us love them in the first place: flavorful, yummy and flaky! and flaky pillows of flavor are a breeze to make.